Eating out isn’t something that we get a chance to do very often, not because we are parents but because it’s often difficult for us to find the time. If we do treat ourselves it’s usually to a takeaway at home when the little one has gone to bed. 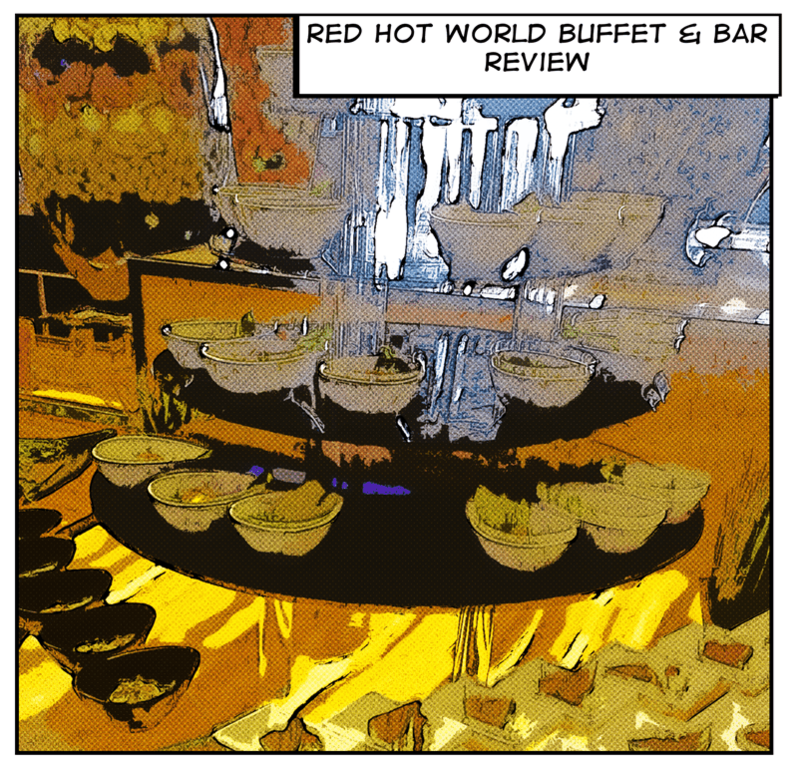 When we were asked to review the Manchester restaurant of Red Hot World Buffet we jumped at the chance. Not usually a massive fan of buffet style restaurants as the food can be left under the lamps for a while and not very fresh we went with an open mind leaving the little one at home so we could enjoy a very rare child free couple of hours together. I would advise you booking a table at busy times as they can often get so busy they have to turn people away, we experienced this on our first attempt to visit the restaurant but luckily the second time we used the online booking form which only took a couple of minutes and confirmation of our booking was emailed to us. We love eating out as a family but I’m glad we had left Isabelle at home, on a Saturday afternoon the restaurant was heaving. We were seated straight away and very surprised at how helpful the waiter was, he took our drinks order and asked if it was our first time visiting the restaurant. As it was our first time there he explained how things worked and where we could find the various stations, he also wrote his name down on our placements in case we needed him later on which I thought was quite a nice touch. It was time to explore and see what they had to offer, we discovered an overwhelming amount of food over various stations on their vast menu. 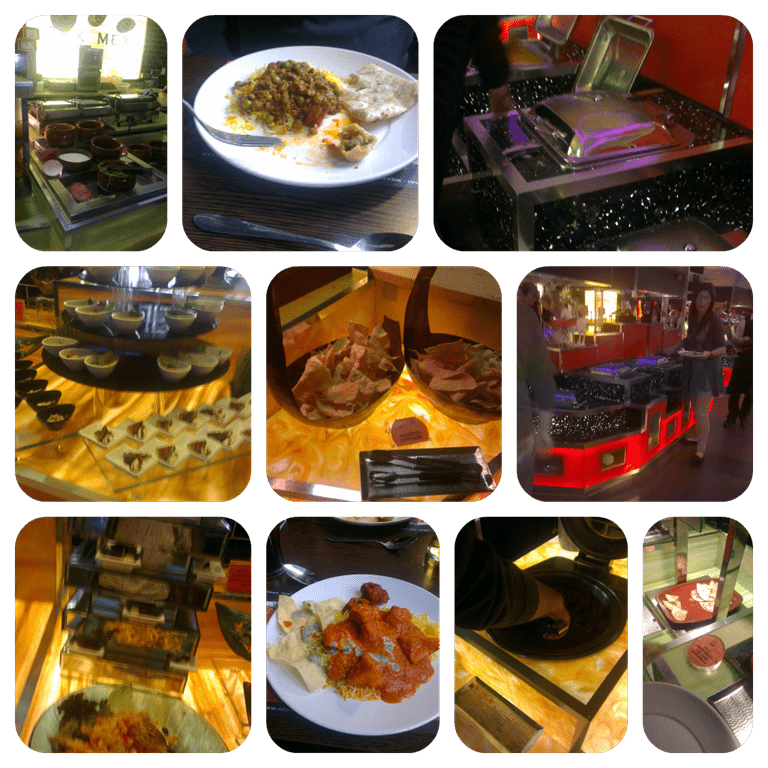 These stations included (but were not limited to) Chinese, Japanese, Thai, Indian, Mexican, Italian, and a Sushi Bar plus an extensive salad section, cold cuts & cheese and the largest drool worthy dessert section I’ve ever seen in a buffet. I made a mental note to save lots of room for dessert. We tried to sample as much as we could from the different cuisines without over facing ourselves so we did a very couple type thing and shared what we had with the exception of my Greek salad, I couldn’t share that. I loved the Mexican quesadillas and they packed quite a lot of authentic spice, in fact I was rather impressed that the quality of food was great and it was constantly being refreshed (mainly because as soon as it was put out it flew off the plates) My favourite savoury section was the indian section, the Saag Aloo and Aloo Gohbi and Tarka Dal were honestly really lovely and I stuffed my face with the Indian naan bread. Each section was manned by chefs who were busy preparing their cuisines which was great, usually if a restaurant covers a lot of different cuisines it’s never great food but having chefs that know the cuisine means that the food was really good. I couldn’t fault anything on our visit although I was a little disappointed that the Sushi bar was only available in the evenings but I can understand that it takes a lot to prepare so on my next visit I will defiantly make sure its in the evening so that I can sample the sushi. I was very near full, actually who am i kidding I was bursting at the seams but the desert section was calling. 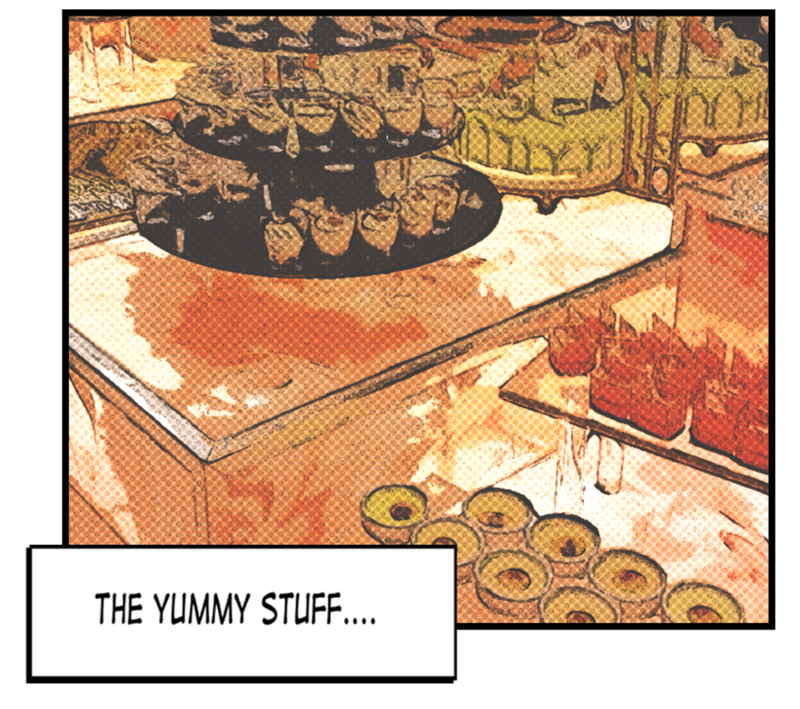 In order to provide an honest review for you lovely readers I hit that dessert section just for you…honest! 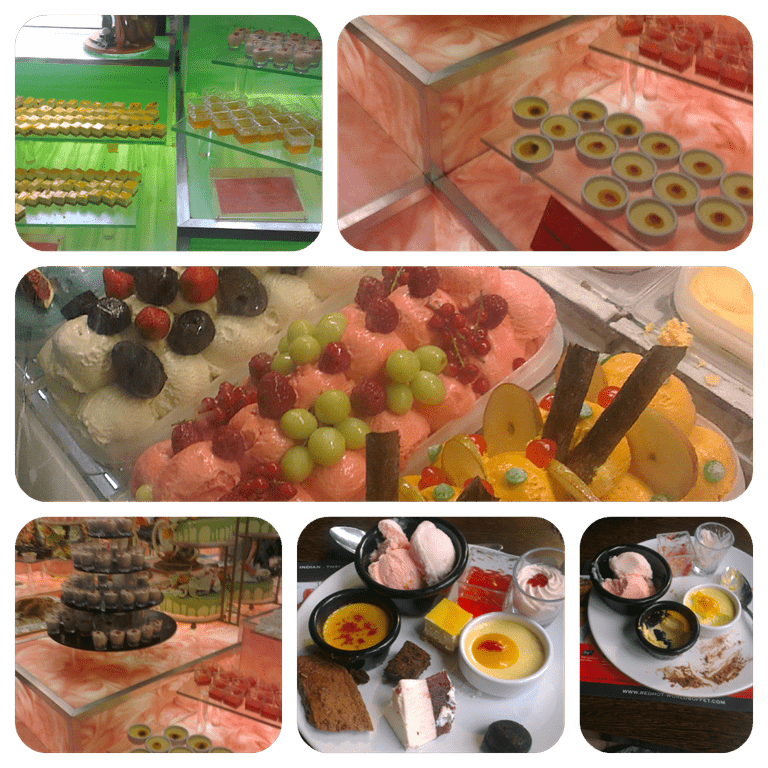 I was like a child in a sweet shop with the huge display of desserts and I could not decide on what I wanted, so I made an executive decision….to try everything and that it what I did. Panna cotta, passion fruit cheesecake, jelly, mousse, ice-cream, chocolate brownies, apple crumble, fruits, crème Brule, you name it, I grabbed one of everything. I may have been a little over ambitious but they were delicious, obviously I couldn’t eat it all but I so wanted to. I was rather sceptical that one restaurant could pull off that many different menus and different cuisines but I impressed with what I had. I may now be a buffet convert just for the fact that I can pick and choose what I like and eat as much of little as I want. I’d be lying if I said no! The food was lovely, and a bargain for the price. I would pay the price of just so I could hit the dessert section again. Even though it was busy it was easy to see what was available and the food area had a great. The service was excellent and the staff were very friendly, they checked to see if we were enjoying our meal a couple of times throughout. The price was great at £9.99 so we could not fault it one bit. Overall, I would recommend this restaurant to anyone. *I received £30 towards the cost of our meal but all thought and opinions were my own and not influenced in any way. Sponsored Post: World Baking Day – Who will you bake for?